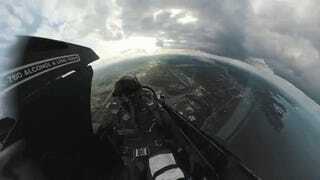 Putting a camera in the cockpit of a jet fighter is nothing new, but this F-16 demonstration flown by USAF Maj. John “Rain” Waters gives the view a startling new perspective on the action. Most cockpit videos are filmed with the camera fixed to the dashboard or cockpit glass, and the point of view shifts with the jet as it turns and spins and rolls. For this demonstration flight during Air Venture 2018, however, Waters filmed his performance using a spherically stabilized VIRB 360 camera. Now, rather than the camera turning with the jet, the jet turns around the camera. It’s definitely a different experience to the videos we are used to seeing. On the one hand, it’s a bit disorienting, but on the other, it seems to make more sense. Perhaps because the horizon stays level even though the plane is going through aerobatic maneuvers. Later, when the camera goes almost full fisheye, things get really interesting. And keep an eye out for the G meter in the bottom corner of the dashboard during some of the maneuvers. Another bonus of this video is that it doesn’t have a soundtrack other than the jet engine. As Waters takes part in the heritage flight with the A-1 Skyraider and P-51 Mustang, listen to how he works the throttle to stay even with the much slower prop planes.